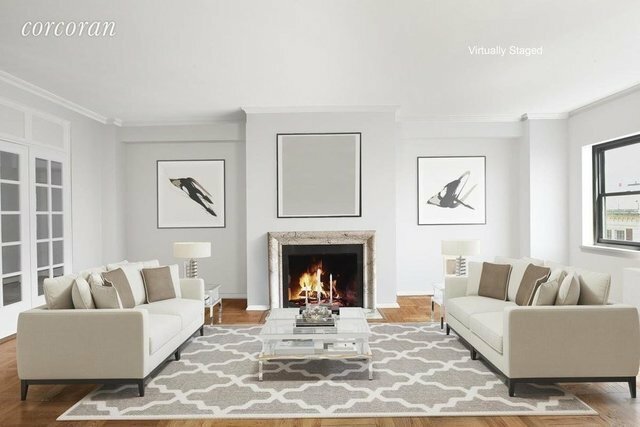 This is a Spacious High Floor Classic 7 Room Apartment at 20 Sutton Place South with great light, a wood-burning fireplace, 9'3" ceilings and lovely east and north views! The grand entry gallery has beveled glass doors leading to a good-sized living room. Currently configured as 3 bedrooms or 2 bedrooms and a library, plus a separate full-sized dining room. Two of the bedrooms have en-suite baths. The third bathroom is in the hallway outside the second bedroom. The fourth bathroom can be reinstated within the kitchen. There is an enlarged kitchen with a grandfathered washer/dryer and a separate service entrance. In addition, there are 10 closets throughout. This is an excellent opportunity for anyone needing a truly spacious apartment with a great layout at an unbelievable price. An ideal canvas to add your touch to the kitchen and bathrooms. At approximately 2300 square feet, it is priced for you to make this your dream home! (Please note: The photos display the apt. virtually staged and also as the apartment is now, freshly painted, parquet floors throughout, without furnishings. )20 Sutton Place South is a luxury post-war non-smoking building that features a full-time doorman/concierge, resident superintendent, fitness room, beautiful roof deck, storage, and a small resident parking garage, when available for purchase. Pets are allowed on a conditional (case by case) basis. There is also a 2% Flip Tax.